Yes, I go on and on about seeking originality in movies. But, that should always be tempered with a grain of salt, as I'm seeking originality within certain parameters. A film can certainly come across as unique when it is surreal or experimental. Weird definitely has its place in cinema, but weird simply for the sake of being weird can often alienate the audience. I'm looking for movies which take familiar elements and present them in a new way, or scramble genres to create something which feels new. This will allow the viewer to become engaged while experiencing something which feels fresh. As this is a rarity, we must celebrate movies like The Dressmaker. As The Dressmaker opens, Mrytle "Tilly" Dunnage (Kate Winslet) returns to her tiny Australian hometown after years in exile. She enters the home of her invalid mother, Molly (Judy Davis), who doesn't recognize her daughter. After cleaning Molly's house (and Molly), Tilly unpacks her sewing machine and begins to advertise her services as a fashion designer, and immediately begins to make lavish gowns and garments for the ladies of the town. This despite the fact that Tilly is somewhat of a pariah. Years ago, Tilly was involved in a an incident which forced her to be removed from Molly's care and taken out of town. She has now reappeared not only to regain her identity, but to take revenge on the hypocrites who shunned her in the past. From the moment that Tilly exits a bus and says, "I'm back, you bastards. ", The Dressmaker has a different vibe to it. She enters the dusty main street of the town, brandishing her Singer sewing machine, as if they were her six-guns. Yes, the film opens with the elements of a Western, as Tilly returns to the tiny, remote hamlet seeking her revenge on those who wronged her years before. It then morphs into somewhat of a Southern Gothic, as we are introduced to the townspeople and their various secrets. It seems that most everyone has a dark past, some of which is linked to Tilly. Of course, these individuals don't recognize their own sins, but have no trouble looking down their noses at Tilly and Molly. The film then becomes more of a drama, as Tilly lets her guard down and allows herself to get close to Teddy (Liam Hemsworth), a handsome local. While all of this is going on, Tilly is also dealing with the mysterious circumstances which lead to her begin ostracized in the first place. Based on a novel by Rosalie Ham, filmmaking couple Jocelyn Moorehouse and P.J. Hogan (Muriel's Wedding, My Best Friend's Wedding) have done a great job of presenting a multi-layered, but well-balanced story. With Moorehouse behind the camera and Hogan handling the adaptation, The Dressmaker slowly reveals itself to be many different things rolled into one. But, it does it in a way which isn't jarring or off-putting. The movie is expertly patterned in such a way that every few minutes we get a new revelation which not only propels the story forward, but draws the viewer further in. The growth of the story is echoed in the range of emotions presented here, as the movie is wickedly funny, deeply moving, and can also cause some anger. The story is very boosted by great acting. Winslet is playing a sort of female anti-hero here and she asked to go through a full range of feelings. Judy Davis is both hateful and lovable, as the mother who doesn't seem to want to remember her daughter. The rest of the ensemble are fantastic, most notably Hugo Weaving, as the local law enforcement who has a secret of his own. The Dressmaker was released in Australia and other parts of the world in 2015, and it then garnered many awards in Australia. So, why has it taken so long for this charming movie to make it to America? Why are we treated to so much crap when well-made movies featuring well-known actors are out there waiting for us? I honestly knew nothing about this movie when I began watching it and I was instantly drawn into its mysterious and unique story. If you are interesting in seeing a well-crafted, well-acted, and completely satisfying film, then The Dressmaker is for you. Don't let the title fool you. While fashion is part of the story, the drama and thriller aspects make up the bulk of the movie. Trust me, The Dressmaker fits. The Dressmaker doesn't explain where Tilly learned to play golf on Blu-ray Disc courtesy of Broadgreen Pictures. The film has been letterboxed at 2.35:1 and the Disc contains an AVC 1080p HD transfer which runs at an average of 35 Mbps. The image is very sharp and clear, showing no overt grain and no defects from the source materials. Moorehouse has shot the film in a very natural style, and the colors look realistic and true. The image is never overly dark or bright. The level of detail is excellent and the picture is rarely soft. The depth is also impressive, as the actors are nicely separated from the background. The Disc carries a DTS-HD Master Audio 5.1 track which runs at 48 kHz and an average of 3.5 Mbps. The track provides clear dialogue and sound effects. The stereo and surround effects come into play during any scene in the town, as we are treated to small sounds coming from the various residents. The finale provides some nice surround and subwoofer effects. The speech is always intelligible and the music sounds fine. The Dressmaker Blu-ray Disc contains only three extra features. "The Story" (4 minutes) is a brief featurette which contains comments from the cast and Moorehouse who discuss the themes of the film. 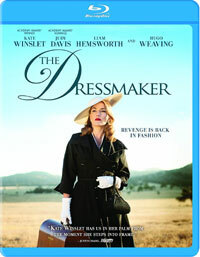 There is a discussion of the costumes, colors, and look of the film in "Designing The Dressmaker" (3 minutes). Finally, we have a "Photo Gallery" with stills from the film.